The First Genocide of the 20Th Century. "I destroy the African tribes with streams of blood... Only following this cleansing can something new emerge, which will remain..." German General Trotha. Many people who have studied the genocides of the 20Th century have long begun with the Armenian Genocide. It seems appropriate to start with the World War One Holocaust. Yet the first genocide of the 20Th century was actually committed by the same country that would carry out the infamous World War Two Holocaust. In the race for supremacy in Africa Germany began its fight to subdue the tribes of Namibia in South West Africa. Its empire there was one riddled with violence. And in most cases this violence was intended not for the maintaining of peace but the expulsion of less desirable tribes. The Herero and Namaqua were two tribes that the German government decided were less than desirable. These two tribes had a long history of being warriors and proud defenders of their territories and possessions. And those two things, land and animals, were not allowed to be kept from white German "settlers". After all, in Namibia Germany would develop the ideas that would lead to the Holocaust itself. Lebensraum was first put into action in Namibia as German settlers pushed further and further into tribal lands. The idea behind the Nazi's most exploited of ideas was that the Father Land had a right to spread its legs so to speak. The people who happened to live on this new German land simply had to be enslaved or expelled. And the food grown here was to be used to grow Germany... not Namibia. The starvation and lack of ability to find water for themselves and their cattle would be the straw to break the camel's back for the Herero. In 1904 the Herero decided that expulsion and starvation were no longer an option. They became a people who wanted, or actually needed, their country back. In the battles that would follow the Herero and Namaqua quickly found themselves at the mercy of the German army. Unable to sustain their rebellion the two tribes were being taken prisoners by the thousands. Those who tried to run were forced into the arid lands at civilization's edge and denied water. The water holes they could find were often poisoned by the German army in an attempt to kill the rebels in hiding. "I, the great general of the German soldiers, send this letter to the Hereros. The Hereros are German subjects no longer. They have killed, stolen, cut off the ears and other parts of the body of wounded soldiers, and now are too cowardly to want to fight any longer. I announce to the people that whoever hands me one of the chiefs shall receive 1,000 marks, and 5,000 marks for Samuel Maherero. The Herero nation must now leave the country. If it refuses, I shall compel it to do so with the 'long tube' (cannon). Any Herero found inside the German frontier, with or without a gun or cattle, will be executed. I shall spare neither women nor children. I shall give the order to drive them away and fire on them. Such are my words to the Herero people." General Trotha. General Trotha failed to mention that he had by this time already killed nearly all the Herero who had ever carried a weapon. His goal in making this declaration to the Herero was to further intimidate the starving Herero still hiding in the arid bushland. He simply was conducting the orders to remove the "undesirables" from German held territory. The Generals own men and other Germans had already recorded his "German soldiers of good repute" brutal attacks on the said "rebels". "I was present when the Herero were defeated in a battle in the vicinity of Waterberg. After the battle all men, women, and children who fell into German hands, wounded or otherwise, were mercilessly put to death. Then the Germans set off in pursuit of the rest, and all those found by the wayside and in the sandveld were shot down and bayoneted to death. The mass of the Herero men were unarmed and thus unable to offer resistance. They were just trying to get away with their cattle." Jan Cloete, German guide. As for the Herero who were captured, if allowed to surrender, death would have been a better option. The second part of the genocide of the Herero and Namaqua came when Germans employed their second most infamous idea... the Konzentrationslager, concentration camps. And the camps they built were the early models that would be seen in the beginning of the Final Solution to the Jewish Question. Mortality rates in these camps would begin around 45% and then quickly spike. Shark Island was the most infamous of these camps. It was used for forced labor and later for medical experimentation. Those who died here were told that they would be turned into food for the sharks... hence the name of the camp. Those who lived were constantly reminded that they were not citizens of their own homeland. They were even more so reminded that they were not considered human to their captors. Food in the camps was limited to uncooked rice and salt. German prison guards denied the Herero pots to cook the rice and refused to allow the prisoners to build cooking fires. As a result the prisoners slowly starved and died of dysentery. While still living they were forced to work on German chain gangs. "There are hundreds of them, mostly women and children and a few old men ... when they fall they are sjamboked by the soldiers in charge of the gang, with full force, until they get up ... On one occasion I saw a woman carrying a child of under a year old slung at her back, and with a heavy sack of grain on her head ... she fell. The corporal sjamboked her for certainly more than four minutes and sjamboked the baby as well ... the woman struggled slowly to her feet, and went on with her load. She did not utter a sound the whole time, but the baby cried very hard." Percival Griffith. Medical experimentation included mainly the forced sterilization, injection with small pox, typhus, and tuberculosis. Herero women who had been raped and later gave birth were forced to hand their "mulatto" children over to people like Eugen Fisher who would study them as his test subjects; all the while calling them "Rehoboth bastards" and "of lesser racial quality". The studies Fisher did upon these children were the same studies later done on the Jews and Roma. Fisher would take his subjects away to study their eyes, the length of their noses, the width of their skulls, and the proportions of their bodies. When finished with them he would have them killed. It was at the end of his studies that Fisher decided that genocide was the only solution for "lesser racial quality" individuals. He noted, "whoever thinks thoroughly the notion of race, can not arrive at a different conclusion". In the end the German involvement in Africa would come to a close with the beginning of World War One. Until then the Herero and Namaqua would be continually subjected to the genocidal ambitions of the German government and its settlers. It wouldn't be till nearly a hundred years later that the German government, let alone its people, would even admit that "perhaps genocide may have occurred" in Namibia. 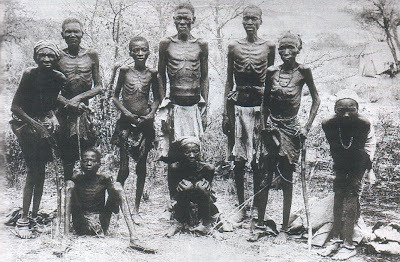 As for the rest of the world the genocide in Namibia is somewhat forgotten. Much like other genocides this one has fallen away from our history books due to the depressing reality of what horrible things we have done to one another.